The Nebraska On-Farm Research Network recently shared results from 40 on-farm trials evaluating corn planting population. These studies showed that net returns to planting rate were most commonly maximized at 34,000 and 28,000 seeds per acre for irrigated and rainfed corn, respectively, when corn was valued at $4 per bushel. However, the economic optimum planting population may vary from year to year and spatially within a field. On-farm research is an excellent way to identify the correct population for your farming operation. With variable rate planting technology, more in-depth research is made feasible, allowing you to obtain information about site-specific response to planting populations. There are several approaches to evaluating variable-rate planting. The approach you choose should be based on your overall goal. The first approach focuses on identifying optimum seeding rate ranges for different management zones within a field. Management zones with varying productivity levels are delineated using the data you have collected from your field. The primary factors impacting productivity vary from site to site; high resolution spatial data, such as yield maps, along with your knowledge of the field are key to identifying these factors. Once management zones have been determined, a range of planting populations can be tested within each productivity region. To do this, strips of several planting populations will be replicated within each management zone. In Figure 5, two contrasting management zones were identified in the field. Eight planting populations were tested in each zone to determine an optimum planting rate. Figure 1. Two management zones were identified in this field, allowing for more precise management according to actual field conditions. Figure 2. This map shows how one farmer created a plant prescription to test five planting rates in his field. Another approach focuses on validating variable rate planting prescriptions that you have developed for your field. This method uses check strips of a standard seeding rate to verify the variable seeding rate choices in different areas. 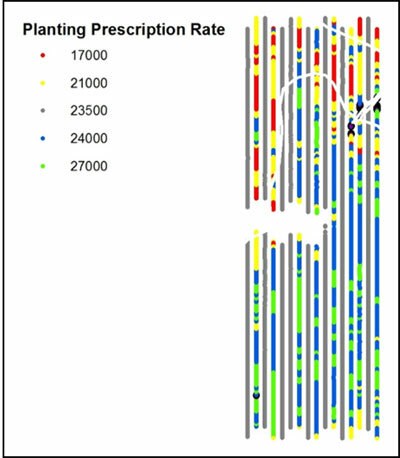 In Figure 2 a grower designed a variable rate prescription map with four planting populations in different areas of the field. Strips of his standard seeding rate were added to evaluate the variable rate prescription versus the standard rate. There are numerous other approaches for evaluating site-specific planting rates and members of the Nebraska On-Farm Research Team can help you design a study specific to your research objectives. The Nebraska On-Farm Research Network is sponsored by Nebraska Extension in partnership with the Nebraska Corn Growers, the Nebraska Corn Board, and Nebraska Soybean Board. Through it farmers work with Extension educators and specialists to design research they can conduct on their farms to answer their crop production questions. Please contact anyone on the Nebraska On-Farm Research Team if you are interested in learning more about or conducting on-farm research. All our study protocols are posted on the CropWatch On-Farm Research page.